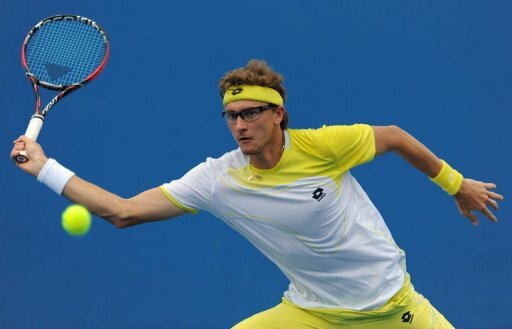 Denis Istomin of Uzbekistan plays a return at the Australian Open, on January 17, 2013. Istomin capitalized on all five break point chances as he advanced to the ATP Tour’s SAP Open quarter-finals with a 6-3, 6-7 (5/7), 6-2 win over Benjamin Becker on Thursday. Denis Istomin capitalized on all five break point chances as he advanced to the ATP Tour’s SAP Open quarter-finals with a 6-3, 6-7 (5/7), 6-2 win over Benjamin Becker. The sixth seeded Istomin, who finished runner-up in the event last year, needed one hour and 49 minutes to continue his mastery over Germany’s Becker. He has now beaten Becker in three of four career meetings. The 26-year-old Uzbek has reached the quarter-finals in three tournaments this season, including at the Brisbane International where he lost in the quarter-finals to Andy Murray. He also made the final eight at a tournament in January in Sydney, Australia. In other matches Thursday, Alejandro Falla breezed past seventh-seeded Marinko Matosevic 6-4, 6-4 in 87 minutes. Falla next plays third-seeded Sam Querrey, who defeated 2003 San Jose winner Lleyton Hewitt, of Australia, 7-6 (8/6), 1-6, 7-6 (7/4), for a place in the semi-finals. Eighth seed Xavier Malisse outlasted Australia’s Matthew Ebden 5-7, 7-5, 7-6 (7/1). Malisse came out on top in a final set tie-break to clinch the win in two hours and 27 minutes. American Steve Johnson advanced to his first career ATP Tour quarter-final after winning an all-American clash over Tim Smyczek 6-3, 6-3. Johnson managed to save four break points in the win.